AiClay - a Haven of Miniature Food: Christmas is early this year. Yup, 8 months earlier haha. 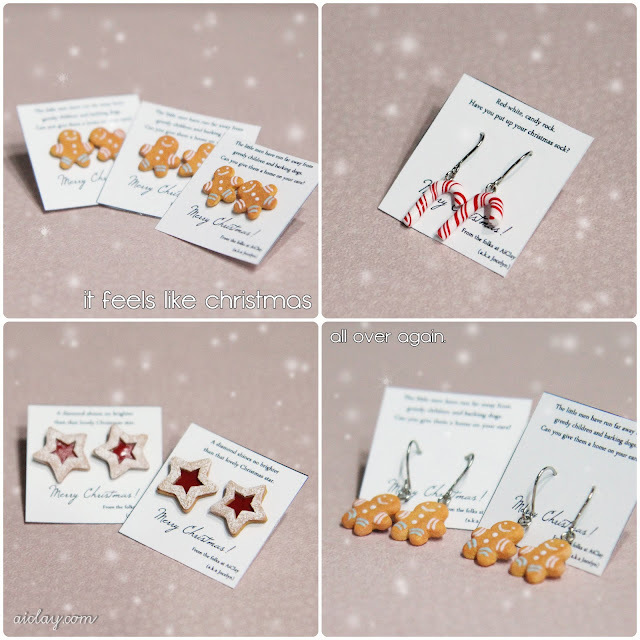 I finally decided to post this photo of some Christmas earrings I made last December, the backlog of photos is just crazy! You may laugh at the ugly snowdrops, I lazily photoshopped them in using brush only so the effect leaves much to be desired. And then I decided, heck since I'm backtracking till Christmas, it wouldn't be a bad time to introduce a treat from Chinese New Year. So here you have it, a smiley pineapple tart pendant. If you're not familiar with Chinese customs, pineapple tarts and cookies are the usual stars of the festival, because of it's auspicious sounding name - 黄梨 if you read it in Hokkien dialect it means to welcome prosperity. Posted this photo on the facebook page (which you should really check out if you have facebook! ), and everyone managed to guess that it was actually a miniature camera perched on a actual DSLR. I'm beginning to have a collection of miniature cameras, it's time for a group shot soon! Yesterday was an extremely low day for me, nothing worked out and I was kept waiting for a long time for dinner, and you know what they say about hungry women. The low blow came when I was finally served a half-assed effort at wanton mee, by a kitchen assistant who was clearly at her first day at work.Very unsatisfactory dinner, and way to end the day to say the least. Tried to make up by ordering a nice dessert which was more expensive than the dinner, but the damage was already done. For the rest of the night, I was also thinking hard about AiClay (when am I ever not?). Someone once told me about the struggle for a lot of craft businesses. Simply put, crafting and business require a very different skillset and few possess both qualities. For the few craft businesses which have taken off successfully, I'm forever in admiration of those behind it. But unfortunately, it is not the case for mine. Without going into too much details, I just wish I was more focused and able to juggle many roles at once. Being the sole person behind AiClay, I'm the one who liases with customers, accepts orders, sculpts, sends out packages, takes photos for marketing, listing in online stores.. the list goes on. That said, it is also why I fully appreciate every comment or like on my flickr/facebook/blog, it's a wonderful boost and makes me work harder. So, please keep them coming, and I can never thank you guys enough if you've managed to read till this point. 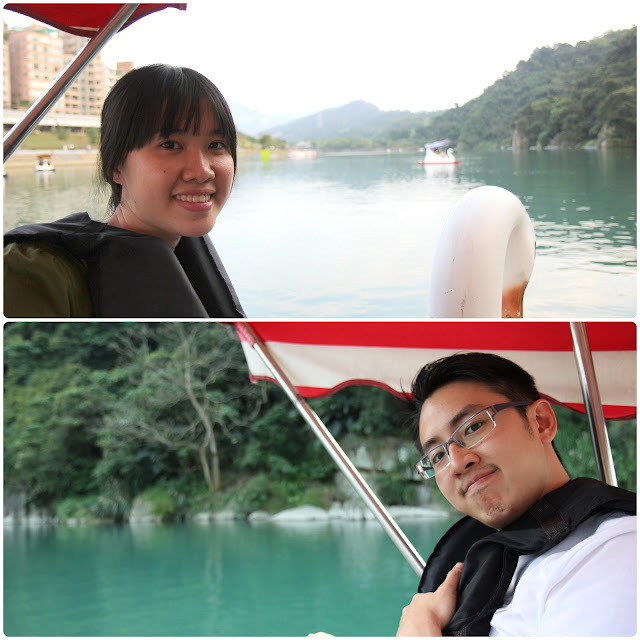 Ending off this depressing post with a happier photo of me and JY riding on a swan boat in Taiwan. :) You work so HARD! I know what it's like and I admire the job that you do! I often wish there was someone to do all the nitty gritty stuff for me so I could just get on with painting! I feel you! Amber Dawn: Hello! I wish I did but I don't work hard enough though! :( Thanks for always commenting, I truly appreciate it! Xhanthi: hahah, totally right! All those nitty gritties add up to a whole load of time! ilovelittlethings: hahahhaha! that cracked me up and I need to go tell him! and my, I'm looking forward to the day when I can hire someone too (prob like never) haha. Rachel! I can't believe I just saw this comment. :) Thanks so much for reading my blog, and crafters' power to you too! ♥ Lovin' your stamps! and JY does look pretty good there. HAHAH. tell him that. hahaha, and yes doesn't his skin look amazing, tsk hahaha!